To get a grip on where a company is going you have to understand where it has come from. Fortunately, that doesn’t mean reading every annual report. Usually, it’s not enough to read the latest annual report. To understand a firm’s business model and strategy, how it makes money, how it plans to make more, and what might go wrong, you need to know about the past. Life’s too short to read every report, so I’m selective. I give the most significant reports the full treatment, and trace the most significant aspects of the business back over many years. One of the easiest ways to lose money in the stock market is to assume a firm that is prospering currently will continue to perform well. The future is often less predictable. By looking back at past reports we can discover what has made companies perform poorly, and make judgements about how susceptible they will be to similar factors in future. In 2009 though, Character lost money. 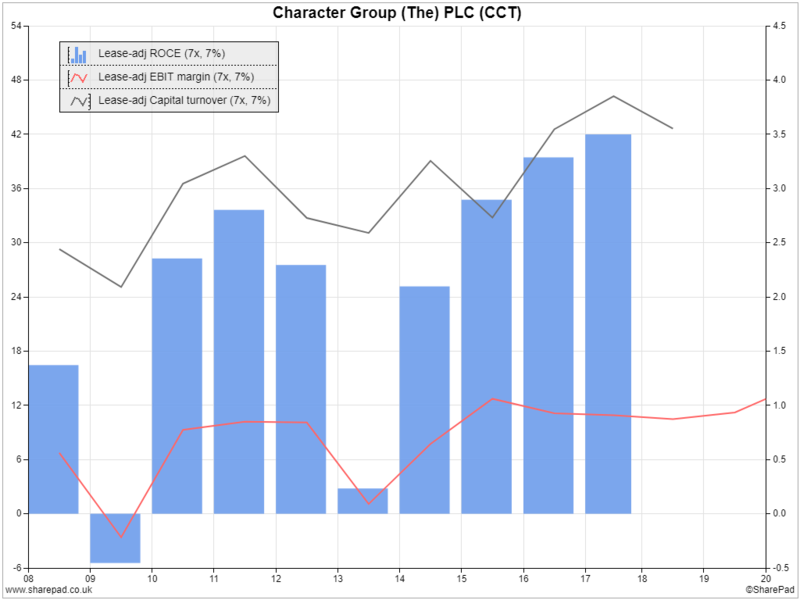 Its return on capital employed (ROCE – blue bars) was negative. In 2013, it barely profited. Looking back at the report for 2013 is less revealing than it should be. Annual reports are supposed to explain a firm’s performance during the year, but Character merely refers to earlier statements. Instead of laying out the situation for shareholders, it requires them to play hopscotch, jumping back through previous trading statements, themselves referring to earlier reports and statements, in search of an explanation. 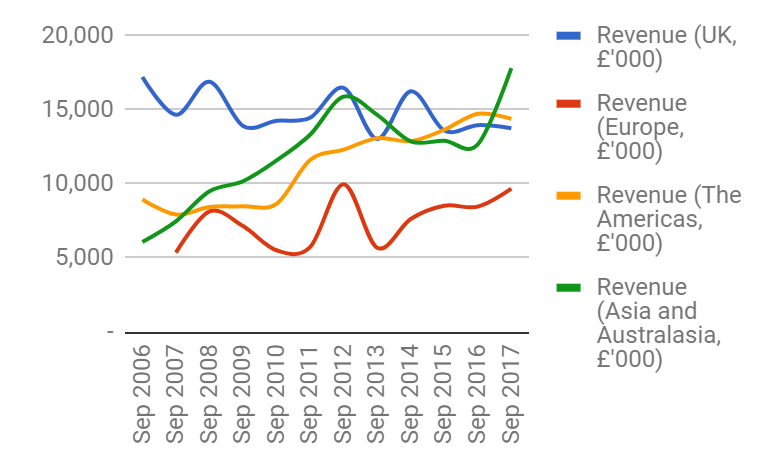 Character’s statements in 2012 and 2013 show demand for toys was unexpectedly low because of the state of the economy, the weather (sunshine is bad), and big events like the Olympic Games. It doesn’t mention fickle taste, but judging by how readily particular brands go in and out of favour, what preschoolers are currently watching on TV may be a factor too because Character designs toys based on TV and film characters. When the firm misjudges demand, it gets stuck with stock it can’t shift, which it has to write-off or sell cheaply. In 2008, Woolworths went bust owing Character money and leaving it with a stockpile of unsold toys. Toy retailing is increasingly competitive. This year Toys R Us has followed Woolies into administration, and I don’t see anything in Character’s reports to suggest history couldn’t repeat itself. That doesn’t necessarily make Character a bad investment, but it should make traders and investors think about how they will get their return because the company’s share price has been even more volatile than the business. 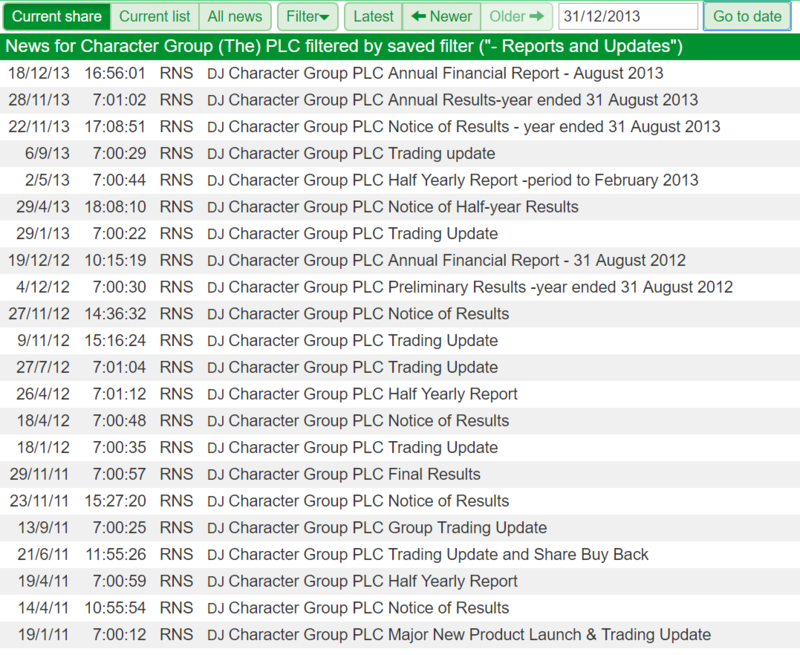 Beyond the many variables we can easily chart in SharePad over time, there are more we can pluck out of annual reports. The most revealing will depend on the business we are appraising. The segmental report, found in the notes to the accounts, is a rich source of insight because it gives investors a glimpse of where the company’s revenue and profit come from. Two regions stand out. Asia and Australia was the biggest and most profitable region in 2017. It earned the company nearly 32% of revenue and nearly 44% of profit. Though Dewhurst earned nearly 27% of revenue from the Americas, it only earned 13% of profit there. The company’s strategic report (starting on P.4 of the 2017 annual report) includes a commentary on the geographical segments, where we learn that the Australian market is buoyant and all four of the company’s Australian subsidiaries performed well. It’s a different story in North America, where one of Dewhurst’s subsidiaries, Elevator Research and Manufacturing (ERM) made substantial losses. In response, Dewhurst has jettisoned the lift door and cab manufacturing parts of the businesses to focus on signalisation, essentially the operating panels and signs telling you what floor the lift is on. 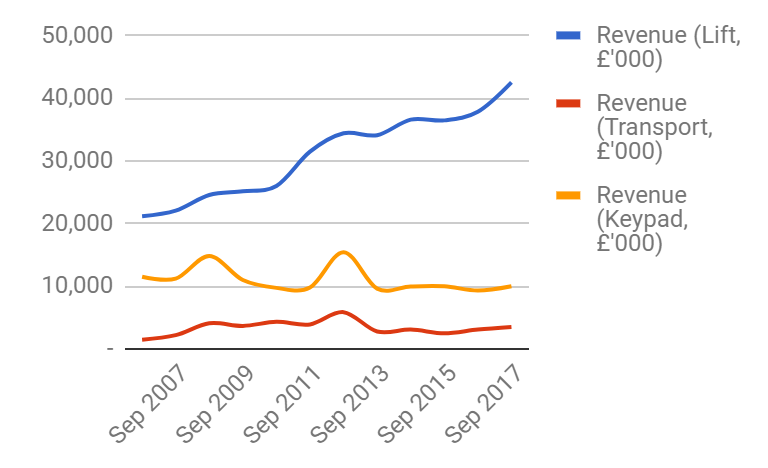 There’s the odd spike in revenue (turnover per share – blue bars), and profit (earnings per share – orange bars), and the odd setback, but generally I think of Dewhurst, which invented the lift pushbutton as we know it, as dependable. Especially considering it supplies the construction sector, which is characterised by a stop-go pattern of heavy investment and sudden contraction. The emergence of Asia and Australia and North America is recent. Not much more than a decade ago, Dewhurst’s home market (blue revenue line) was dominant, but it has actually declined since 2006. 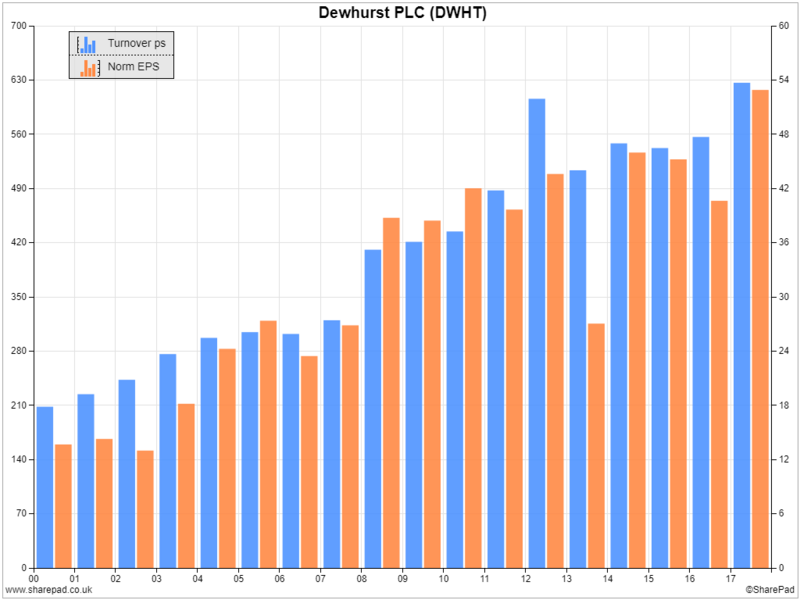 Asia and Australia (green line) has been its growth engine, and North America and Europe have contributed too. Profit margins are all over the place. 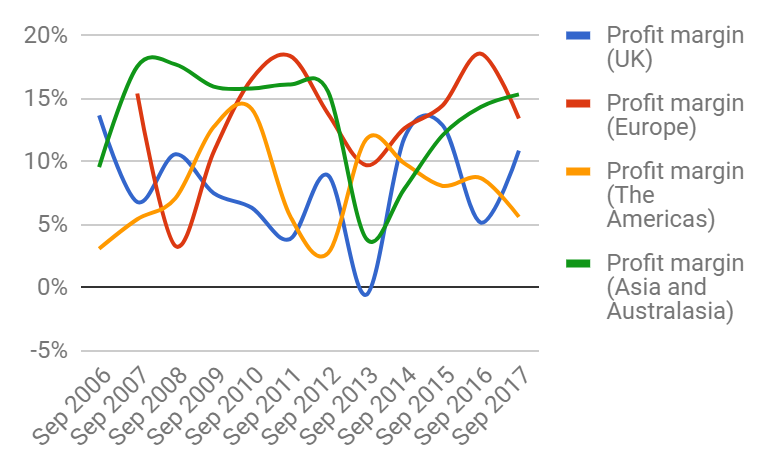 Europe and Asia and Australasia (red and green lines) are generally Dewhurst’s most profitable markets but even those regions have had their difficult years. Dewhurst’s keypad division makes ATM keypads almost entirely for one undisclosed customer (I think it’s NCR). Keypads clearly isn’t a growing business, and Dewhurst admits it might go into decline due to the rapid adoption of cashless payment systems. The Transport division is mostly Traffic Management Products, a company acquired in 2006 that makes bollards and other “street furniture”. It’s probably contracted because cash-strapped local councils aren’t spending, dragging on UK profit margins. Now for a confession. Though I like the company, I don’t like its annual reports. Dewhurst’s reports are better than Character’s because they explain how the company performed, but they do not say much about strategy. We can make deductions about Dewhurst’s strategy from the data, though. Evidently, Dewhurst has diversified. Its diversification into street furniture has not been a success but its geographical expansion has been more fruitful and this is how the company has achieved stable growth even when its constituent segments are unstable. 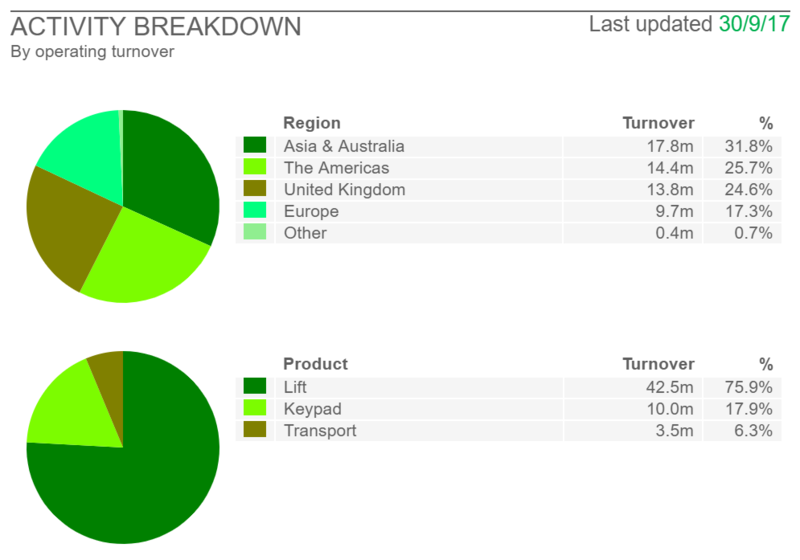 A somewhat painstaking search through Dewhurst’s annual reports for acquisitions shows it has grown in Australia and the USA in part by buying lift interior and component suppliers there. Its most recent acquisition was last year, P&R Lift Cars, which is in New South Wales. Previously in 2013, it acquired Dual Engraving in Perth, Western Australia. Before that it acquired JAS, which it merged into Australian Lift Components, acquired back in the mists of time. It acquired ERM, in California, in 2010. That’s about as much as I can glean from the annual reports. To confirm and elaborate on the story, I need to approach the firm directly – the subject of my next article.